iPhone App Will Be Released Soon. Android App Will Be Released Soon. Need Credit Card Debt Consolidation? Many California residents struggling with credit cards and other unsecured debts are may be in search a debt relief option that will not only provide much-needed relief, but possibly save a substantial amount of money each month. The goal behind a debt consolidation plan is to combine or "consolidate" all of your high interest unsecured debts into a single, less stressful, and more structured payment each month made to a debt consolidation company. The debt consolidation, or credit counseling company then has the task of distributing on time payments to each of your creditors until all debts in the program are paid off, or resolved. Before we go into the details of how a debt consolidation debt relief program works, it's important to understand how a credit card debt consolidation debt relief program differs from a debt consolidation loan. To learn more about your available debt relief options, take a moment to answer some simple questions to get a free debt relief savings estimate. Start here. How is Debt Consolidation Different from a Debt Consolidation Loan? While the goals of both debt consolidation debt relief and a standard debt consolidation loan are very similar, the method of getting relief is quite different. In the case of a debt consolidation or debt management plan coordinated by a credit or debt counselor, the goal is to gain an understanding of the debt load a consumer is facing, the amount of money each month that can reasonably be allocated to payoff or pay down debts, and then design a personalized plan that "consolidates" multiple high interest consumer debts into a single, more affordable, payment each month. These plans can help consumers resolve debts as quickly as possible, at a pace they can afford. 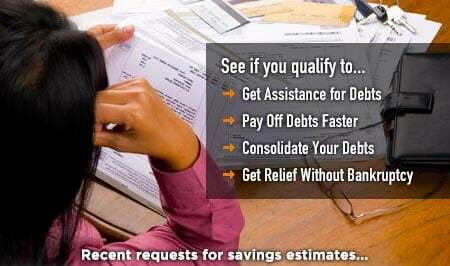 If you are in need of debt relief assistance: Get a free debt relief analysis and savings estimate from a BBB-accredited provider at no obligation. In contrast, a debt consolidation loan involves taking multiple high interest credit cards and other debts and paying them off all at once with the proceeds from a debt consolidation loan. In theory, a debt consolidation loan makes perfect sense in that it can "convert" multiple high interest debts into a single, lower interest rate loan. However, many consumers should be aware that debt consolidation loans typically require that a home or other asset be used as collateral to get approved for the loan. That means if consumers, already struggling with debts, suddenly hit a rough patch financially, they could be putting their home or other asset at risk. What this means is, they may have traded "unsecured" debt that doesn't put their home at risk into a "secured" debt that puts their home at risk. In addition, many consumers who pay off credit cards with the proceeds from a debt consolidation loan end up quickly accumulating a whole new round of credit card debts. In this scenario, consumers now have BOTH a debt consolidation loan and multiple high interest credit cards to deal with and to pay off. Thus, the situation has gone from bad to worse and the cycle of debt continues. The goal of debt consolidation or credit counseling, also known as a debt management program (DMP), is to combine or consolidate multiple high-interest consumer debts into a single, more manageable payment each month. Through the benefits of debt relief such as lower, more lenient interest rates and the removal of late fees and penalties, a debt management plan coordinated by a credit counselor or debt counselor can provide personalized assistance for consumers who need a proven, predictable, accelerated path out of debt. How are plans customized for each debtor? A credit counselor (or debt counselor) typically will interview consumers to gain a clear understanding of all of their debts. Then they will conduct a budget analysis with consumers to find out how much money can be realistically allocated each month to pay down those debts. Finally, based on this information they will come up with a game plan and send proposals to each of the consumer's creditors requesting the benefits of debt relief for the individual or family experiencing financial hardship. These benefits can include lower interest rates, a waiving of late fees and penalties, and generally more favorable repayment terms. Those creditors who agree to the proposals are then added to the debt management plan. For those that do not, consumers are still obligated with creditors according to the terms of their original agreements. 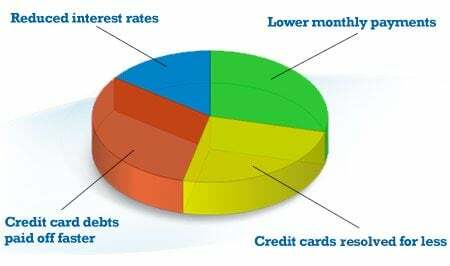 Overall, debt consolidation or debt management plans can be very effective and save a substantial amount of money IF consumers STOP using credit cards AND begin the process of paying down the principal amount of debt on time, month after month, at a LOWER INTEREST RATE. Will a debt consolidation or debt management plan help you resolve debts faster and how much could you save? Find out by requesting your Free Debt Relief Evaluation and Savings Estimate. Residents of California, like many across the country, are struggling and experiencing financial hardships that make it difficult to obtain life's basic essentials, such as food, utilities, rent, or even childcare. To help people who need financial assistance, including the elderly and those needing medical assistance, the state of California has programs and services that help these people get what they need, acting as a sort of lifeline. Examples of such programs include the Children's Health Insurance Program or CHIP, Medicaid, and California Head Start. To find out more about these services and resources, go to the state's homepage Benefits section. Debt consolidation or credit counseling is a method of debt relief that has helped many individuals and families, but it's worth noting that debt management requires discipline and a certain amount of restraint to avoid relying credit cards. In addition, the program normally takes three to five years to complete and for the consumer to take advantage of all the money saving benefits of the plan. On the other hand, an alternative to debt management is debt settlement, considered a more aggressive form of debt relief that may help consumers, facing the prospects of bankruptcy, get out of credit card debt faster, assuming they can accumulate money in a "set aside" designated account which can later be used as the funding source to reach a settlement with individual creditors. With debt settlement, it's customary, that if consumers fall seriously behind in payments, credit card companies may decide eventually to "sell off" debt as "bad debt" to a collection agency. In this scenario, creditors may get as little as 10 cents on the dollar, so it stands to reason that credit card companies may be willing to accept a reasonable settlement offer made by the consumer or by a debt settlement company working on the consumer's behalf to negotiate a settlement. Be aware that when consumers default on the terms of credit card agreements in order to set aside monies in a settlement account, creditors may threaten or take legal action. In addition, money saved through credit card negotiated settlements are subject to federal taxation. Finally, debt settlement typically will have a negative impact on one's personal credit, but not as serious or long lasting of an impact as personal bankruptcy. To learn more about your debt relief options, request Your Free Debt Relief Evaluation and Savings Estimate.